A tropical breeze, an ocean view, and a virgin Pina Colada inspired the creation of this light and airy blend. When you want to bring the tropics home with you after your vacation is over, your Pineapple Coconut body butter or body oil will do just that. Softening and moisturizing your skin as you recall the ocean breeze and sun filled days at the beach, Pineapple Coconut will enhance the texture and feel of your beautiful bronzed skin. 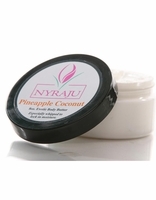 Click the button above to Order your Jar of Pineapple Coconut Body Butter Now!